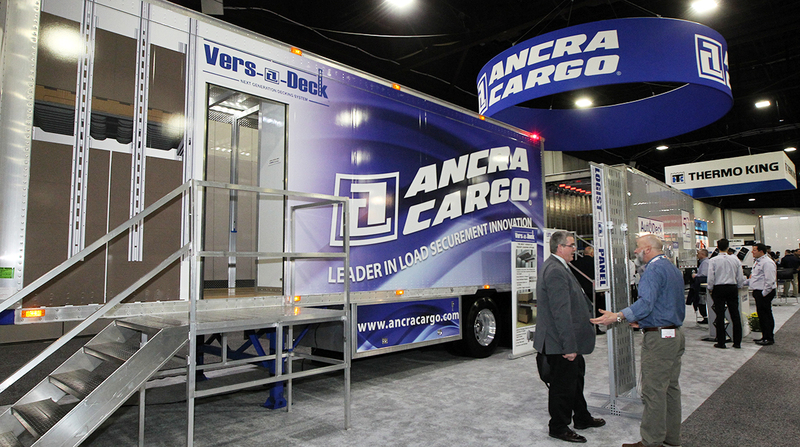 Ancra Cargo specializes in load securement products, such as straps, chains and winches. The system, called AutoDeck, allows dockworkers and drivers to automatically program the height of each beam within a trailer. Beams are the horizontal supports that allow haulers to stack pallets of freight. Decking is aligning the beams so that they can support pallets. Jim Calico, executive vice president of sales and marketing for the company’s cargo division, compared decking to the rafters that support the second floor of a two-story home. The conventional method of setting beams involves using a pole to manually adjust each beam within the trailer to make sure they are the same height. AutoDeck presents a series of buttons near the tail end of the trailer, which a shipper can use to select a beam and raise or lower it to a desired height. The conventional process was time-consuming and occasionally resulted in damaged cargo, as the pallets sometimes were not properly stacked. Bethel said AutoDeck reduces the time to load a truck by 20%. Greg Kauffman, director of engineering, said it takes about 1 minute, 10 seconds to adjust all of the beams using AutoDeck. “The resulting issue is this is a great time saver,” Calico said. As a safety measure, AutoDeck has a breakaway system, meaning if a programmed beam comes down on a person or a load, it will immediately stop.